IRONWOOD — On Oct. 22, Michigan Department of Natural Resources Conservation Officer Jennifer Hanson received a radio call from the Gogebic County Sheriff’s Office — a man was stranded on a sinking boat on Lake Gogebic in the western Upper Peninsula. Hanson arrived at the scene of a partially submerged boat just in time — returning the man and boat safely to shore. Brian Paal, 63, of Manitowish Waters, Wis., was fishing on his boat when he lost control because the steering became inoperable. When the boat began taking on water from the 2-foot-tall waves, Paal used his cellphone to call 911. Being the closest law enforcement officer in the area with a patrol boat, Hanson retrieved her department-issued boat and met Michigan State Police Sgt. Brett Marshall at the lake. Marshall was able to locate the disabled vessel about 2 miles offshore while Hanson launched her DNR patrol boat. When Hanson and Marshall reached Paal, the boat was partially submerged. Paal was wearing a life jacket, sitting at the highest point of the boat. Conscious and responsive, Paal was very cold from the cool water and air temperatures. Officer Hanson helped Paal onto the DNR boat and was able to secure a line and tow the vessel safely to shore, where Paal’s daughters were waiting and Beacon Ambulance was available to provide any needed medical attention. Gogebic County Sheriff’s Office and Michigan State Police personnel were able to remove Paal’s disabled boat from the water. 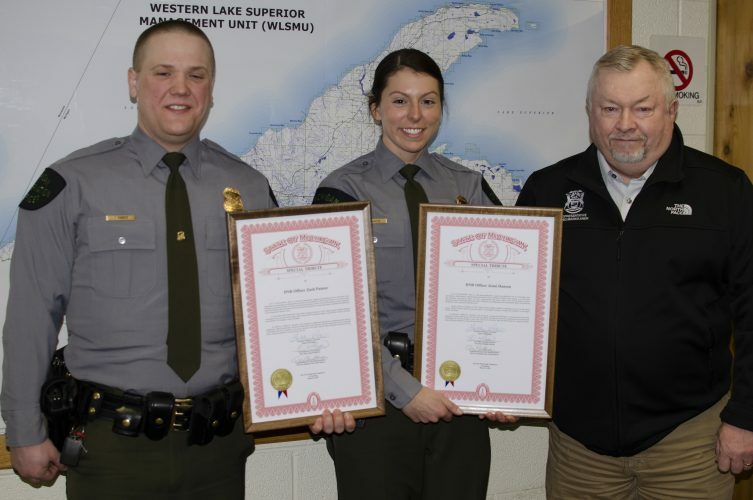 After graduating from the DNR Conservation Officer Academy in December, Hanson completed five months of field training throughout Michigan and in May was assigned to Gogebic County.